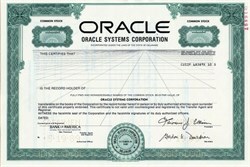 Beautiful engraved RARE specimen certificate from the Oracle Systems Corporation printed in 1989. This historic document was printed by United States Bank Note Company and has an ornate border around it with a vignette of the company's logo. This item has the printed signatures of the Company's President, Larry Ellison and Secretary, Gordon Davidson. This is the first time we have had a certificate with the Oracle Systems Corporation name vs the current name of Oracle Corporation. 1982: Relational Software Inc. renames itself Oracle Systems Corporation in order to align itself more closely with its primary product. June 1, 1995: Oracle Systems Corporation announces the merger of Oracle Corporation into Oracle Systems Corporation. This transaction eliminates the holding company structure and streamlines the operating company, Oracle Corporation, with the public holding company, Oracle Systems Corporation. As part of the merger, Oracle Systems Corporation is renamed Oracle Corporation and is the surviving entity incorporated as a Delaware corporation. Oracle Corporation (NASDAQ: ORCL) is an American multinational computer technology corporation that specializes in developing and marketing computer hardware systems and enterprise software products � particularly database management systems. Headquartered at 500 Oracle Parkway, Redwood Shores, Redwood City, California, United States and employing approximately 111,298 people worldwide as of 30 November 2011, it has enlarged its share of the software market through organic growth and through a number of high-profile acquisitions. By 2007 Oracle had the third-largest software revenue, after Microsoft and IBM. Larry Ellison, a co-founder of Oracle Corporation, has served as Oracle's CEO throughout its history. He also served as the Chairman of the Board until his replacement by Jeffrey O. Henley in 2004. On August 22, 2008 the Associated Press ranked Ellison as the top-paid chief executive in the world. Lawrence J. Ellison (Larry Ellison) has served as Oracle's CEO throughout the company's history. Ellison served as the Chairman of the Board until his replacement by Jeffrey O. Henley in 2004. Ellison retains his role as CEO. Forbes magazine once judged Ellison the richest man in the world. Ellison was inspired by the paper written by Edgar F. Codd on relational database systems named A Relational Model of Data for Large Shared Data Banks. He had heard about the IBM System R database from an article in the IBM Research Journal provided by co-founder Ed Oates, also based on Codd's theories, and wanted Oracle to be compatible with it, but IBM stopped this by keeping the error codes for their DBMS secret. He founded Oracle in 1977 under the name Software Development Laboratories. In 1979 SDL changed its name to Relational Software, Inc. (RSI). In 1983, RSI was renamed Oracle Systems to more closely align itself with its flagship product Oracle Database with Robert Miner as senior programmer.